More than 100 students, teachers, parents and community activists from one of Chicago's smallest public elementary schools turned out on Friday night, February 5, 2010, to tell the Chicago Board of Education and the Board's hearing officer that the Board should stop playing "data driven" games with their lives, their communities, and the lives of children and keep Paderewski open. 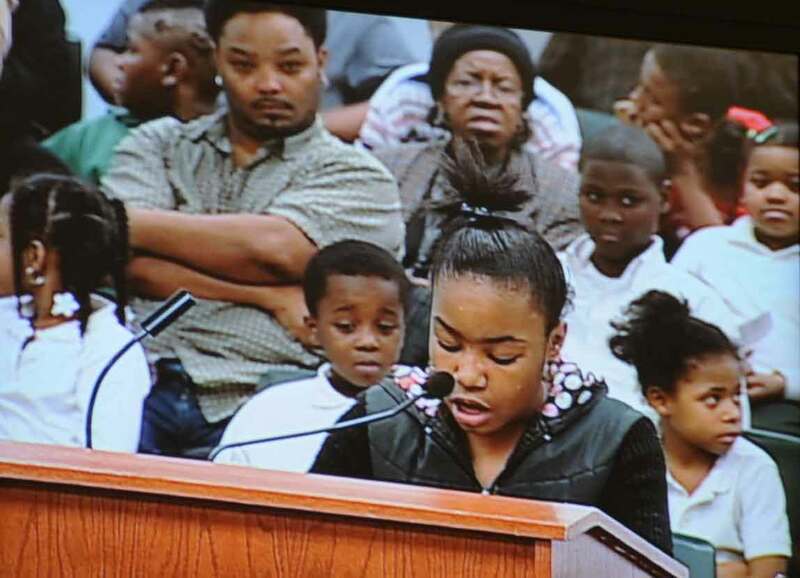 Ignace Paderewski fifth grade student Mikema Rich testifies before the Chicago Board of Education hearing on the proposal to close Paderewski on February 5, 2010. Many of the children who spoke out against the closing of their school can be seen in the background in the above photograph. The children of Paderewski are just the latest among the tens of thousands of African American children who have been displaced and in some cases destroyed by the ruthless policy of school closings that was begun by Chicago Mayor Richard M. Daley more than a decade ago and continued after 2004 under the name "Renaissance 2010." More than a dozen Paderewski students refuted the Board's claims that the school should be closed, and warned that gang violence in "K Town" where the children would be sent (to Mason school) would be severe. Substance photo by George N. Schmidt.Most of the speakers at the Friday night hearing were children from the Lawndale community who attend Paderewski (located at 2221 S. Lawndale). As usual, the majority of the people who showed up to protest against another planned school closing were minorities, mostly African Americans. 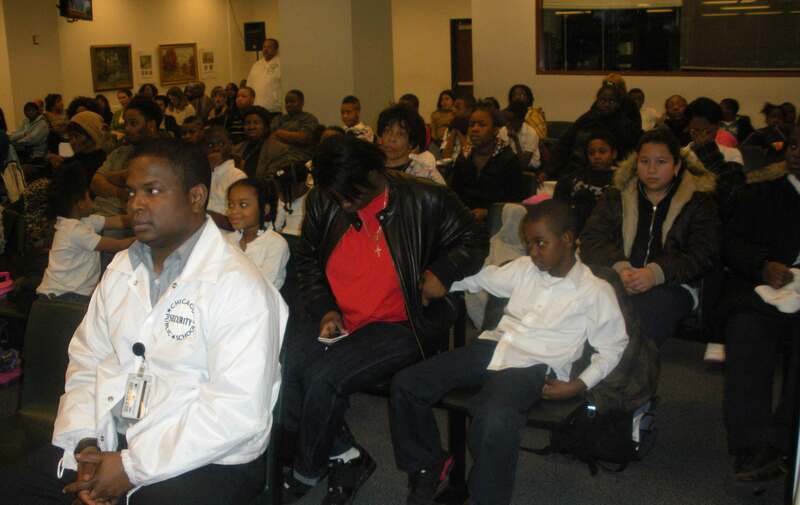 Part of the crowd of more than 100 teachers, students, parents and community leaders who showed up and testified on behalf of Paderewski Elementary School at the Friday night hearing on the proposed closing of the school on February 5, 2010. Substance photo by George N. Schmidt.The hearing was the latest on the 14 schools on what community leaders are calling the 2010 "Hit List" of schools to be closed this year. For the past decade, the Chicago Board of Education, under Mayor Richard M. Daley, has been closing public schools, most often to turn them over to semi-private operators as charter schools. The following links will take the reader to some of the remarks made to the Board on Friday night. If the link is not hot, you can copy and paste it and get to it. Substance is still working to incorporate more technology into this site and these reports. The final edited version of this article and the accompanying graphics were posted at www.substance news.net February 7, 2010, 6:00 a.m. CDT. If you choose to reproduce this article in whole or in part, or any of the graphical material included with it, please give full credit to SubstanceNews as follows: Copyright © 2010 Substance, Inc., www.substancenews.net. Please provide Substance with a copy of any reproductions of this material and we will let you know our terms. Alternatively, please make a donation or take out a subscription to the print edition of Substance (see red button to the right). We are asking all of our readers to either subscribe to the print edition of Substance (a bargain at $16 per year) or make a donation. Both options are available on the right side of our Home Page. For further information, feel free to call us at our office at 773-725-7502. Collegial groups and teachers using this material for class use should simply inform us of the extent of your usage. Anyone utilizing this material for commercial purposes is in violation of U.S. and other international copyright laws. Copyright 2010 Substance, Inc. all rights reserved.